Cleanse the Major Organs and Detoxification Systems of the Body with our 6 part program. Medicardium will help cleanse the body of heavy metals and calcification build up in the circulatory system and organs. Xeneplex will go deep into the cells and draw out toxins such as chemicals, thallades, plastics, old drugs, pharmaceuticals, chemicals, benzene’s, etc.. Glytamins will dissolve stones, promote healthy bile flow and repair the liver. 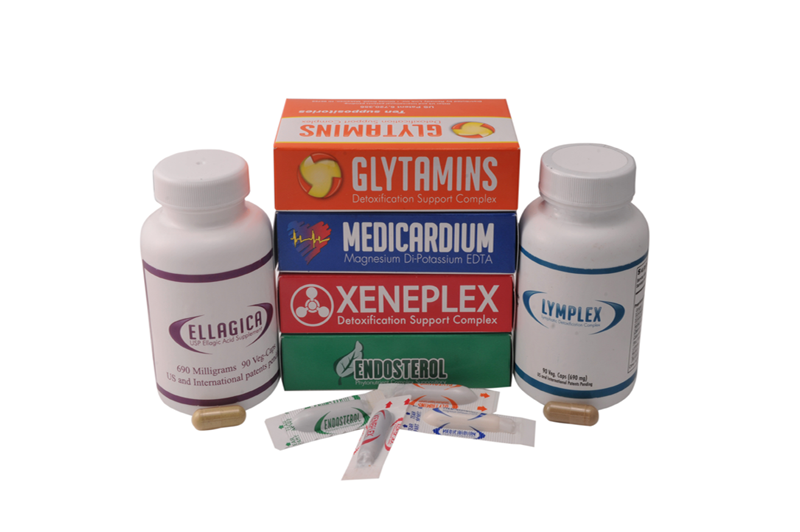 Endosterol will help men with prostate problems and women with breast health, weight loss being a side benefit. Lymplex is designed to cleanse the important lymphatic system and lastly Ellagica will help fight off bacteria, fungus, molds, viruses, & candida. A subtle but powerful way to promote long term health with our unique and effective distribution method that helps the body absorb 50 to 80% more than oral supplements. Watch Video Presentations of the individual products by clicking on the pictures or links below.